This past weekend was pretty dreary. It was cold, rainy and quite boring…actually. Piyush and I had intended on going somewhere fun for our anniversary; but because of the weather, we changed our plans and decided to stay home. Our actual anniversary is Wednesday–May 9. Three years have just flown by! 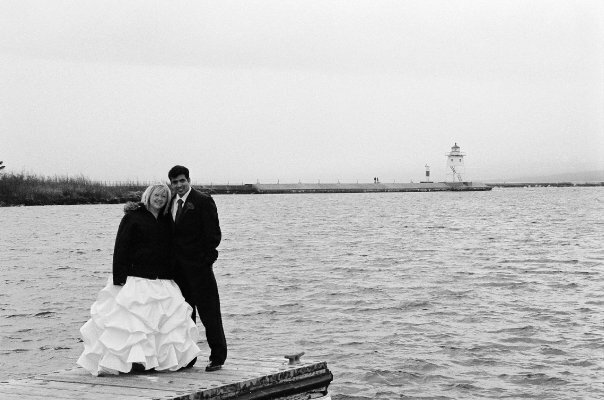 05.09.2009 …Grand Marais, MN on Lake Superior. It was so cold! So instead…Piyush did a lot of golfing. I did a lot of reading. We both watched Hindi movies, and got absolutely no yard-work done. It turned out to be a perfect weekend! I didn’t really do much cooking, but did manage to make it to the Rochester Farmer’s Market on Saturday morning. I came home with some black garlic. I’ve never seen it before and I’m not entirely certain what I’m going to make with it; but I’m excited to experiment! 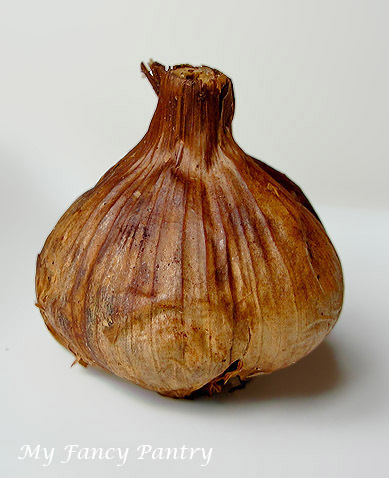 Black garlic is simply regular garlic that has been fermented. The cloves are a dark black color and the smell is quite pungant. I haven’t tasted it yet, but I have been assured that it tastes slightly sweet with a molasses-like richness. It’s supposed to be completely amazing. …Right now, it’s sitting in a ziploc bag in my garage. haha! Yes, it smelled so bad that I had to banish it out of the house! Has anyone ever experimented with black garlic? What did you make with it? 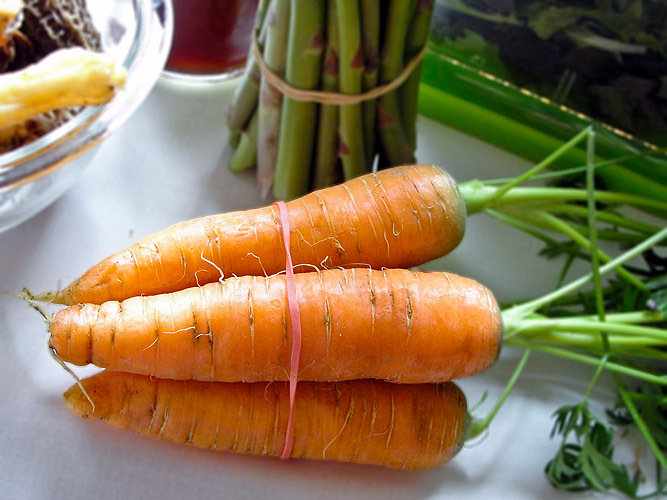 Look at those fat carrots! 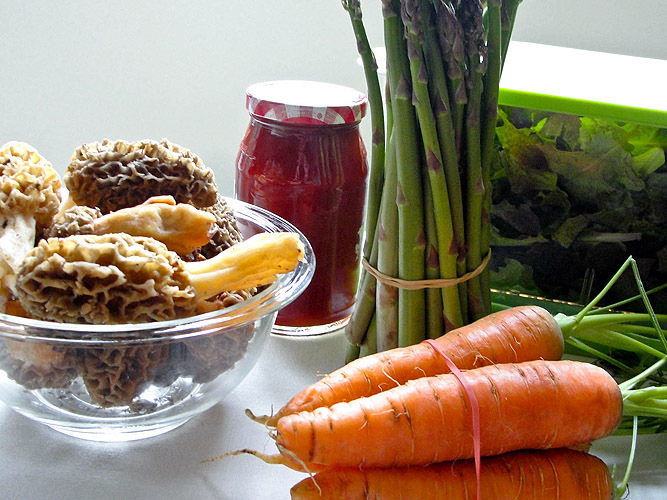 morel mushrooms, homemade ketchup, asparagus, spring lettuce mix and carrots! I cleaned the mushrooms as soon as I got home from the market. 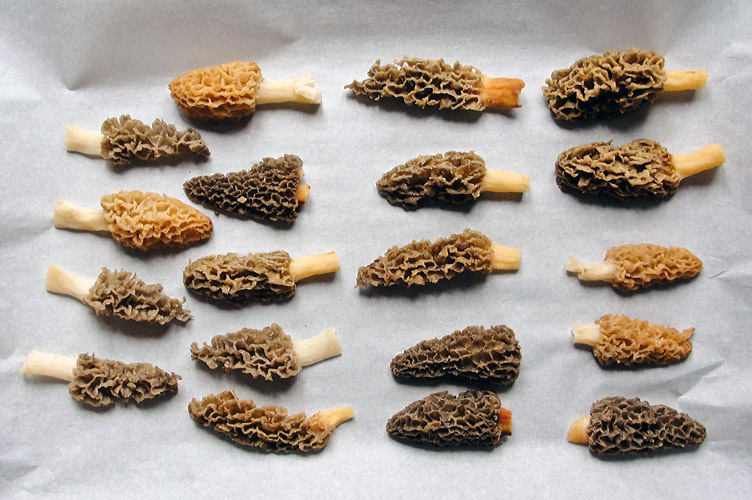 I’ve got to say, cleaning the morels was not a fun experience! There were bugs everywhere! But somehow I managed. 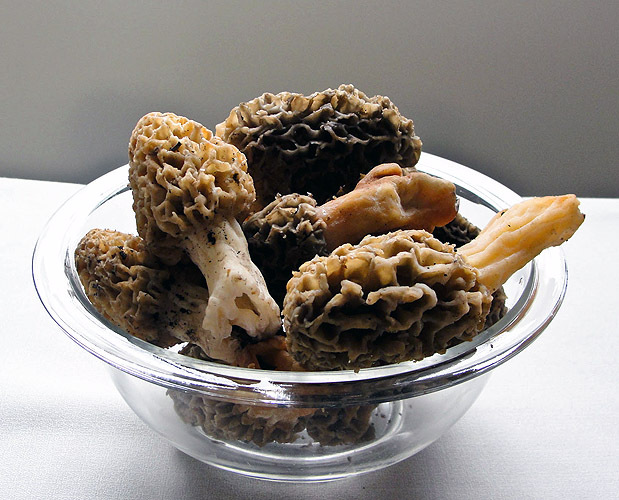 I froze about a half pound of the mushrooms so Piyush and I can enjoy them later in the summer or maybe even this coming winter. Now, on to the curry! Because I had brought home some new produce, I had to use what was already in my refrigerator. I had nearly a whole head of cauliflower and half a green bell pepper. 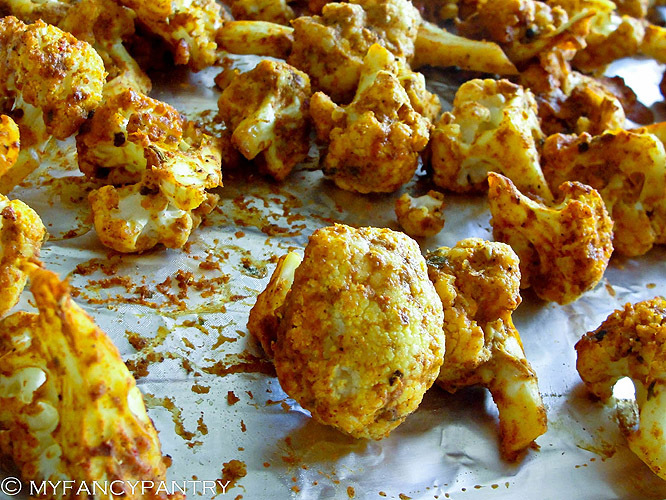 I thought about making aloo gobi (potatoes and cauliflower), but decided on something else. I didn’t want meat, but I wanted chicken tikka masala…if that makes sense? I thought I’d make the gravy for chicken tikka masala but use cauliflower chunks instead. I marinated and roasted the cauliflower in the the same way I would the chicken. I tossed some yogurt, lemon juice and spices in a big zip-lock bag and mixed everything together. Then I threw the cauliflower in, tossed everything to combine, and let it rest for a good hour. 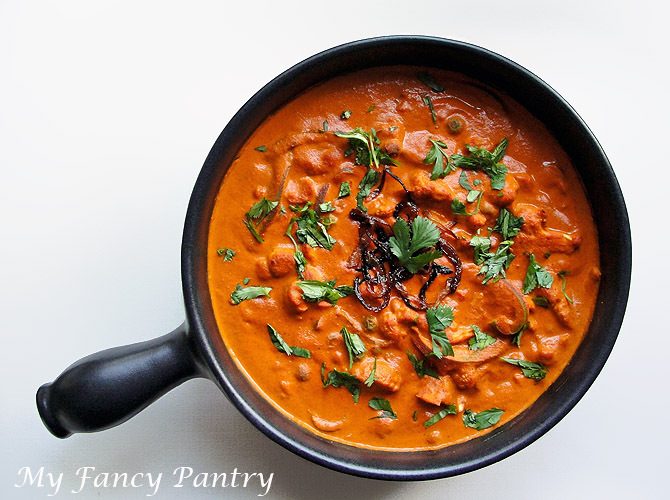 I then made the curry gravy using my recipe for chicken tikka masala. The only thing I did differently was to add sliced green bell pepper and about a cup of peas. I also made a small mistake and put extra (2 tbsp!) hot chili powder in the curry instead of the paprika. Yikes! This stuff was good, but really packed some heat! 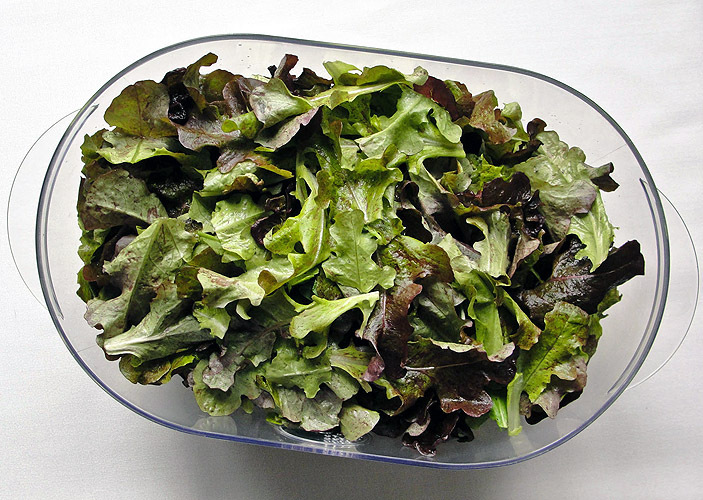 Can be made vegan by substituting dairy with vegan alternatives. red chilli powder, to taste –taste as you add! Sometimes, less is more!!!!! Combine all ingredients, except cauliflower, together in a bowl. Whisk until everything is mixed together. Add the cauliflower. Let the mixture marinate for at least 20 minutes, up to an hour. When you’re ready to cook it, you can put it on skewers and grill it–or you can use your broiler. Heat the oven to Broil. 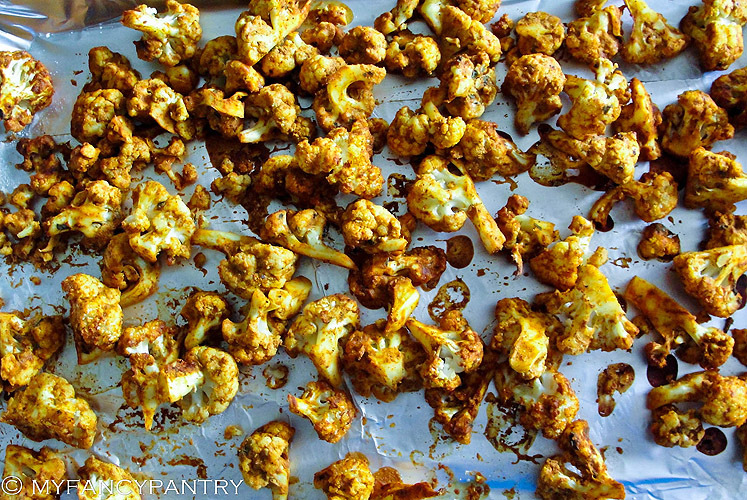 Put the cauliflower pieces on a rack over a baking sheet lined with aluminum foil. Toss in the garlic and ginger. Cook for about a minute before adding the tomato paste, red chilli powder and fenugreek leaves. Stir everything together. It will be dry. Add the cooked cauliflower, capsicum (green bell pepper) and peas. Let the curry simmer for about 15 minutes. It’ll thicken slightly, use milk to thin…if you’d like. Garnish with chopped coriander and fried onions. Serve with rice or rotis. This entry was posted in Adventures, Food, Indian, Recipes and tagged curry, healthy recipes, Indian, Local Attractions, Vegetarian/Vegan on May 8, 2012 by Shari. that looks incredible! i am going to try it. 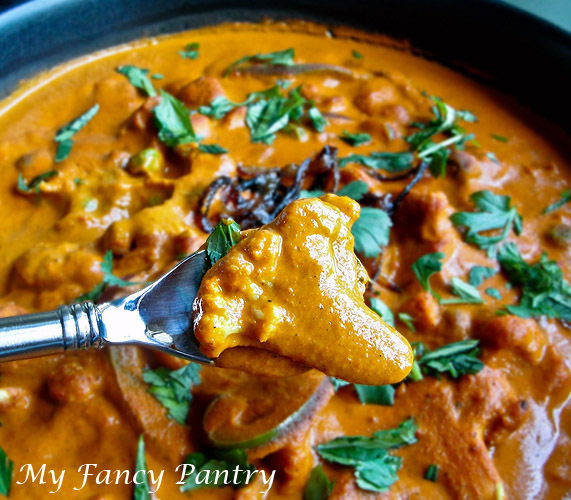 curry recipies are so fun to prepare working with all the spices thanks for the great post! 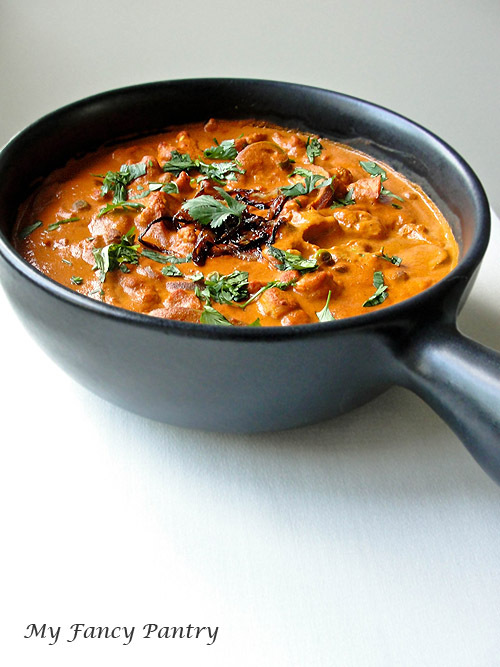 This is one of the best looking curries I have seen. 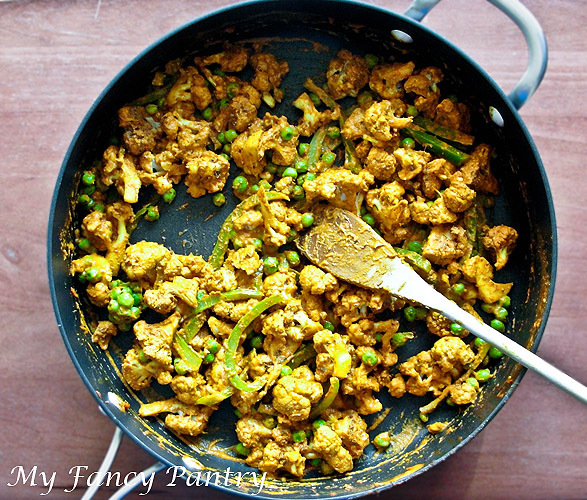 The color is simply mesmerizing, I must make this when having vegetarian friends for dinner! This is making me so hungry. I had no plans for cooking but I have a head of cauliflower sitting in the refrigerator! And your recipe is totally tempting me to make it! I’ve just had breakfast but now I feel hungry again. Going to try this curry! Look great! Homemade garam masala is exceptional! I hope you like the recipe! I made this for dinner last night..it turned out delicious. My family loved it. Thanks for sharing your recipe. I’m glad you enjoyed the curry…and that your family did too! Thanks for trying the recipe! I tried this recipe a few months back and now make it all the time. It’s such a hit in my family. Thanks for sharing. Thank you for sharing this recipe! We love eating Indian food and now I love cooking it! This recipe is now a favorite in my household, including 3 little picky eaters! I am going to try the Chicken Tikka Masala next time. I will have to double the recipe for the curry base next time, because it goes fast! This was lovely! Definitely one of my new favorite recipes. I’ve made it several times. Tonight, I used the roasted cauliflower recipe, sautéed collards with ghee & spices, and put over rice. SOOO quick and simple. Thanks for teaching, sharing, and inspiring! 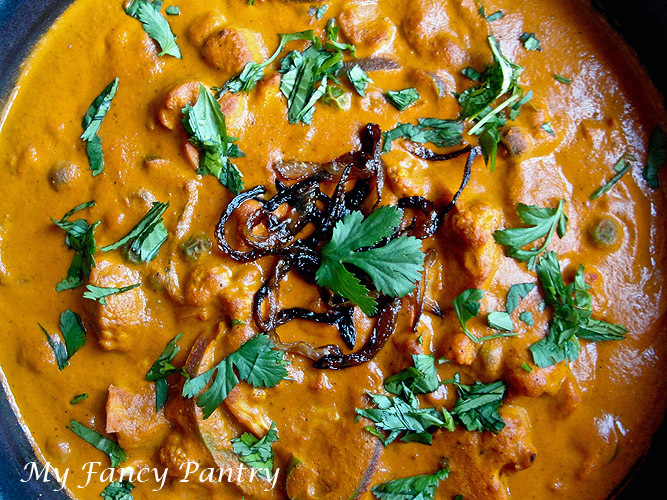 Have curry base in the freezer waiting to try this. Do the whole spices grind up completely in your blender? Hello Lorri!! So glad you are giving this a go! I use a Vitamix blender which does a great job at grinding the spices completely. If your blender is less powerful, using pre ground spices is a great option. I hope you love the curry! Hi, just I try this recipe..awesome, really good. My family loved it.thank you ..